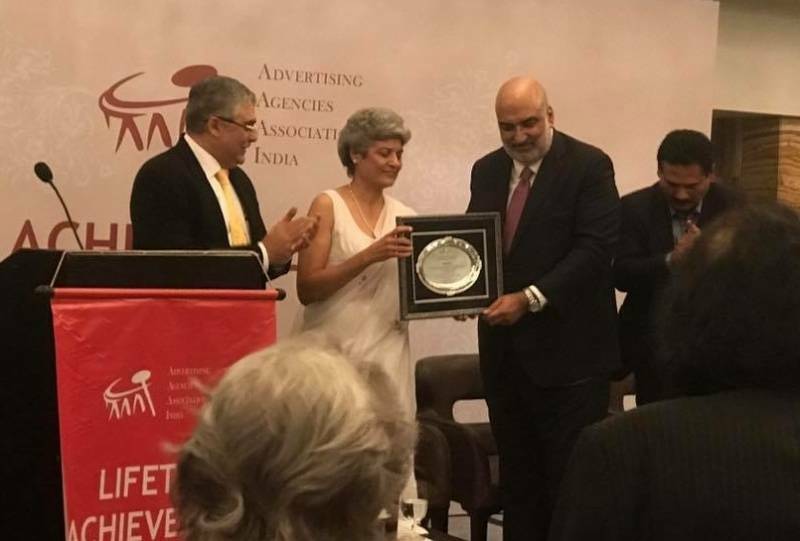 Roda Mehta, doyen of Indian advertising who played a legendary and pioneering role in establishing scientific media planning and buying in India, was felicitated with the AAAI Lifetime Achievement Award on Friday, July 4, 2017 in the presence of who’s who of the advertising fraternity and her former colleagues. Roda Mehta built a whole generation of media professionals for the advertising industry. She joined Hindustan Thompson Associates (now JWT) in 1971 and became the first MBA and first woman in the Media function of an advertising agency in India. She moved to Ogilvy Benson & Mather (now Ogilvy & Mather) in 1975, and rose from Media Group Head to Media Controller for the Mumbai office in 1976 to representing Media for the first time on the Managing Committee of the Mumbai office in 1978 to being sent to London for 3 months to introduce Account Planning and Research in the Indian operation in 1980 to the Board as Director – Media & Research in 1982. She transferred, as President – South in 1992, became Director - International Client Service in 1994, and Managing Consultant - the Media Network in 1996. Along the way, she pioneered Outdoor planning and buying and set up a Rural Media network to service client requirements. 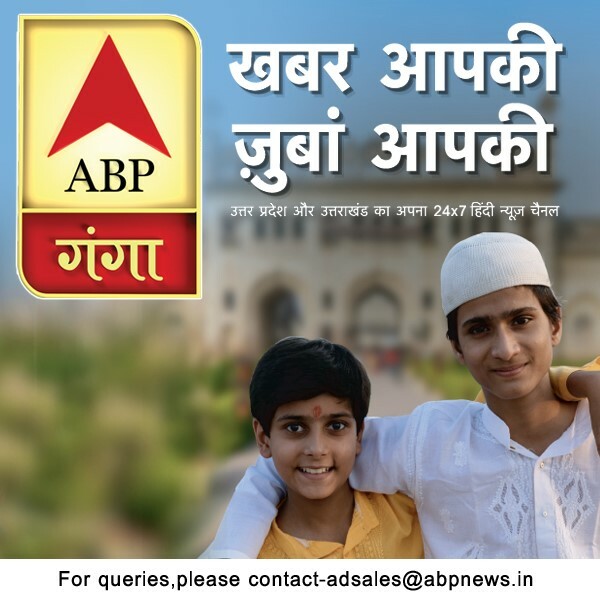 Invited on several committees and associations by the industry, including the Expert Committee on TV Marketing for Doordarshan & AIR, she was Founder Member of the Market Research Society of India (MRSI) and Founder Member and Chairperson - Technical Committee of the Media Research Users Council (MRUC). She chaired MRUC from 1994-96. Ms Mehta was also on the Board of several other committees including Advisory Board - Ministry of Information & Broadcasting (Govt of India), AAAI’s Media Disputes Committee, Economic Times Advisory Panel, etc. An avidly sought after speaker at industry conferences/seminars, she served as faculty on training programs run by Ogilvy & Mather India and Asia Pacific. Roda Mehta bagged several prestigious awards including the David Ogilvy Award for Asia Pacific & Agency of the Year Award (Public Service) 1992 for the National Literacy Mission campaign. Currently she is associated with several non-profit organisations as a Trustee of the Lila Poonawalla Foundation, which provides scholarships and mentoring to economically challenged girls from Maharashtra for post-graduate, graduate/diploma and secondary school education; Board Member & Treasurer of Nagrik Chetna Manch, a citizen’s watchdog organization on public expenditure. She administers a very active Citizens’ Whatsapp Group for civic affairs of PMC Ward 21 and is a practitioner of Kriya Yoga. The industry was gushing in its praise for Mehta. 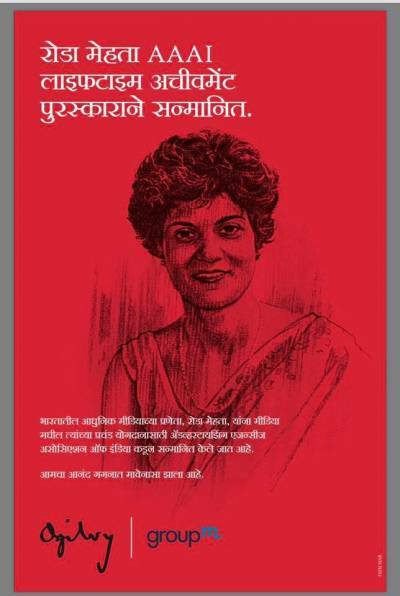 To all, she has been an inspiration, a purist on measurement and someone who spearheaded data base approach in media planning. This sentiment was share by Bobby Pawar, MD & Chief Creative Officer, Publicis India, who felt that Mehta should have been honoured by this Award many years back as “she is the most deserving person for this award”. Though Vikram Sakhuja, Group CEO, Madison Media and OOH, never worked with Mehta, he said that in the 90s, she was one of the most respected media agency professionals. “Roda Mehta stood out as being a purist on measurement, and in training a generation of media planners,” he added. With IPL rights in, what should be Star India’s game plan?